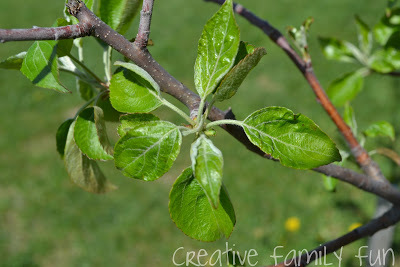 We took a trip out to our side yard recently to take a close look at our young apple tree. We were talking about the different parts of trees and learning about how they grew. We were specifically taking a look at the apple tree because we wanted to know how apples grew. We gathered our supplies.We brought our magnifying glasses for observation. 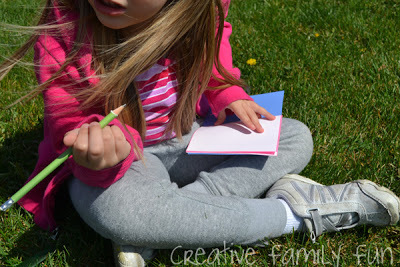 Pencils and homemade notebooks for recording our observations. 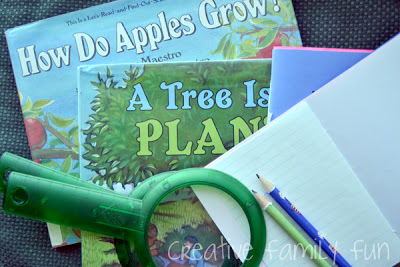 We also brought two books, A Tree Is a Plant (Let’s-Read-and-Find-Out Science) by Clyde Robert Bulla and How Do Apples Grow? by Betsy Maestro, for research. One of my goals with our nature studies, is to teach the girls about observation and drawing their own conclusions using what they’ve observed. We talked about the bark of the tree, then we looked at it through our magnifying glasses and felt it with our fingers. We talked about how apples are formed and looked all over to see if we could see any baby apples. We also talked about the roots of a tree and then discussed why we couldn’t see the roots. Here are some great questions to ask when teaching about observation. How does it feel? Bumpy, smooth, rough, etc.? Lead your kids a bit and help them learn to make observations. For instance, we learned that the bark of a young apple tree is mostly smooth with a few bumps. We also discovered some spots where there was yellow underneath the brown. It’s amazing the things we discovered when we looked closely! While we were observing and talking about trees, Lizzie recorded some of her own observations through drawing. She copied a drawing of a baby tree from one of the books as well as drawing a fully-grown orange tree. Older kids can use the space to record all the characteristics of what they are observing and the conclusions they drew from it. Have them draw a tree and label the parts or just try drawing what they are observing. Do you like to look closely at nature? Have you ever been surprised at what you saw? This is great. 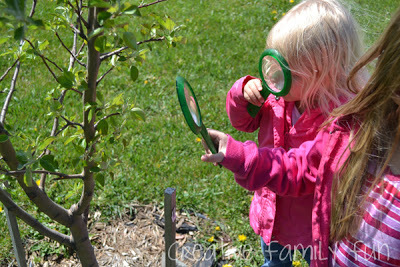 We make observations and outdoor discoveries all the time! Kids are never to young to start observing and looking more closely at the nature that is around them. I love this activity. MY 5 year old would love it. I love this idea – mine are a little young still but we're starting to look for nature and explore it as well. I love that you brought books with you for "research" Very cute! 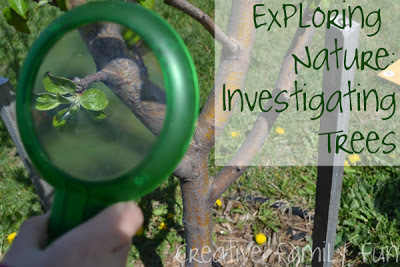 My little ones love exploring with the magnifying glass. So fun!